I used to work in "Corporate America" and worked for a CEO around Y2K who used to say that we needed move out of the "Industrial Society" and into the "Technology Age". He'd always start his speech off with referring to the "Agrarian Society" (one that revolves around agriculture) and then move forward to more modern business eras and concepts. He'd emphasize the fact that we needed to advance from industrial age thinking to technological ways. His main point in all of this was that we were behind the curve in this technological age. He may have been right. But why do I bring this up now? In my recent research about my ancestors, I have found that the majority were farmers. The word agrarian stuck with me all of these years. I must admit to it sounding appealing even at the time of the "Big CEO" speech telling us to move forward. Farming sounded so great, rather mundane, and a whole lot less stress than working in what I was doing in "Corporate America." Don't get me wrong, I liked my job, the people that I worked with, but somehow longed for a simpler time and life. As I've researched my ancestors, a trend in occupation overwhelms the vast majority of my direct line family tree members. As is no surprise, the vast majority were farmers. Farming dominates the occupation category on most census until around the turn of the century (1900). There are a few exceptions to the farming. I find my great great grandfather, Charles McGuire, living in New York City on the 1870 U.S. Census with the occupation of "coachman". As you can probably figure out, that meant he drove a horse drawn wagon. It would appear that his son/my great grandfather, Francis J. McGuire, did the same thing except that he was referred to as a driver. All of this "big city" exception aside, the vast majority of my ancestors were farmers in 1870 whether they lived in Ireland, Germany, or the United States of America. A few questions pop into my head about my "agrarian society" ancestors. Were they strictly farmers? When did the shift from farming to more industrial type jobs occur? Did the women work outside of the home? My German immigrant family, the "Vienop's", were certainly farmers. Even once they were in Napa, California, the oldest generation farmed fruit orchards on their land. However, they brought with them a trade from the old country. They rolled cigars for a living. This actually makes them easy to find on any census in the U.S. in the late 1800s/early 1900s. Not only is their last name unique but their occupation a bit of a standout from the rest. My Flanagan's probably had the most varied occupations early on (the late 1800s) than I have found in my other lines. While they were most certainly farmers, several of my direct line chose other occupations. 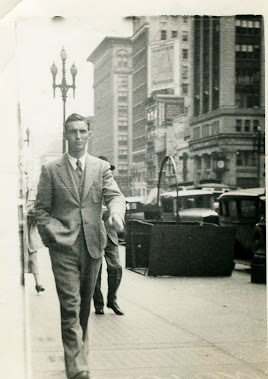 My great grandfather, John Francis "Jack" Flanagan, went to correspondence school to learn mechanical engineering. By 1904, he was he manager of the repair shop at a local car dealership in Napa. As a mechanic, he spent his days quite differently than his childhood years growing up on a farm. By 1918, he was back to being a farmer because there was no one else to run the family farm at the time. As for the women, I have found that my great grandmother, Mary Elizabeth "Minnie" McLaughlin Flanagan was a school teacher. Working outside of the home for women was generally not all that common. Finding her as a school teacher was common for a woman if she did work outside of the home around 1890-1900. One of her sister's, Katie McLaughlin, is indicated as a glove maker in one census after 1900. I can see that from one generation to the next, the agrarian society that many of my ancestors lived in was phased out. By the 1930 U.S. Census, my Vienop Family members are mainly contractors to include carpenters, plumbers, and bricklayers. While they may have still owned a plum or cherry orchard here and there, it was not their primary occupation to farm. In fact, a lot of the picking of fruit shifted to the women in my family. I enjoy seeing what my ancestors' occupations were. While farming could be a tough job, I still see the agrarian society as a back to basics type of life. I love the technology at my fingertips and still like to run my fingers through the soil in my own yard.